Dominic is the Head of R&D and Work Futurist for Atlassian, a company that makes collaboration software to help teams be more effective. Dominic’s play is in the book, Chapter 7 - Job Design, and is titled “Building innovation into jobs and working practices”. Dominic shares the disruptive ‘rituals’ they’ve created at Atlassian which form their culture of innovation, including 20% time and ShipIt, which have helped their teams “take on the impossible” as Dominic says. When the business solutions of yesterday can’t guarantee tomorrow’s success, Dominic Price holds fast to his belief in constant innovation. As Atlassian’s Head of R&D and Work Futurist, Dominic doesn’t want to just break the mold, he wants to break the way we work, too. Debra Corey got the scoop on how his operation is faring. What does a ShipIt event look like? ShipIt is a huge part of Atlassian and is one of the key ways they create an open sourced culture of collaboration and innovation. Find out what it is and why Atlassians rave about this thing called ShipIt. 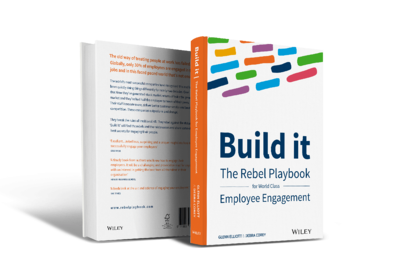 You can get even more tricks and tips on transforming the way you work with Atlassian's Team Playbook. Bad boss, or a case of Leadership Deficit Disorder?